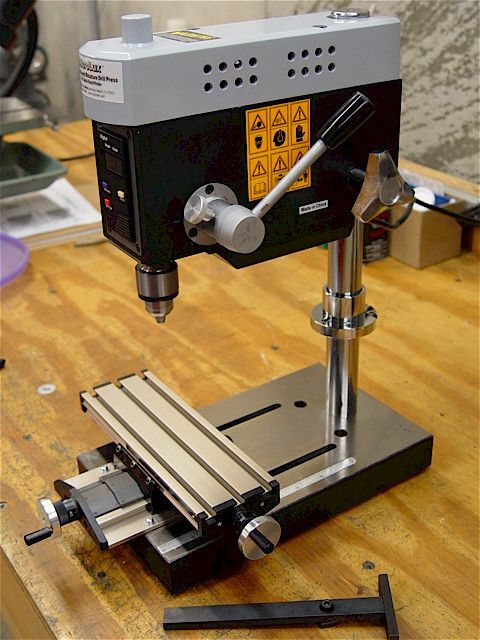 setup rigidity, bit design, bit material, sharpness, length, RPM, feed rate, chip removal, heat, & lubrication. 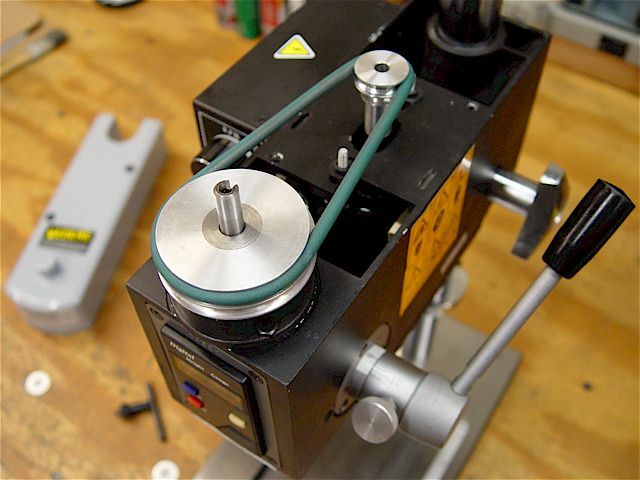 soft metals like brass, lift the work piece, even with a small vise, & dangerously spin them at high speed. 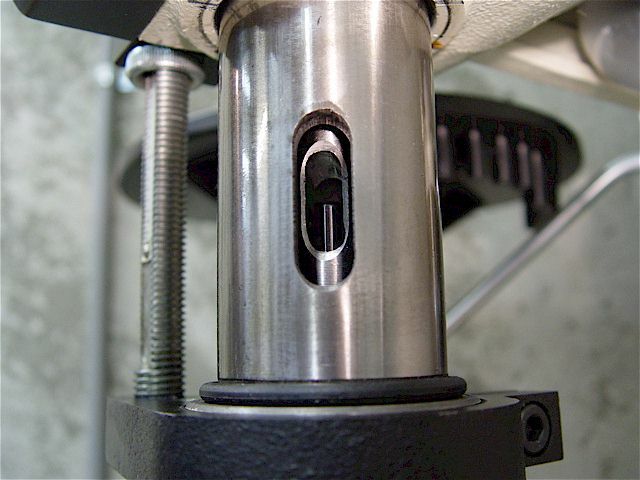 Clamp or bolt down the part. 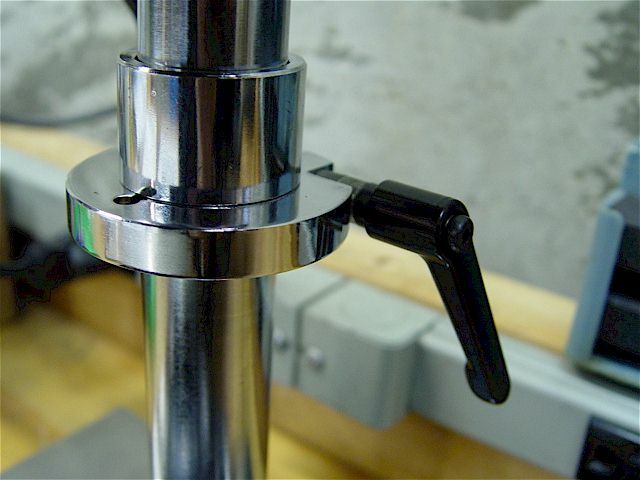 Assure that the drill press head & table are locked onto the column, too. 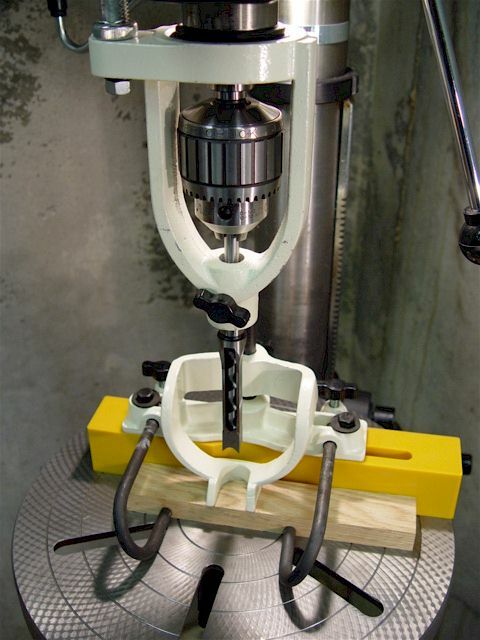 high-clamping pressure milling vise. 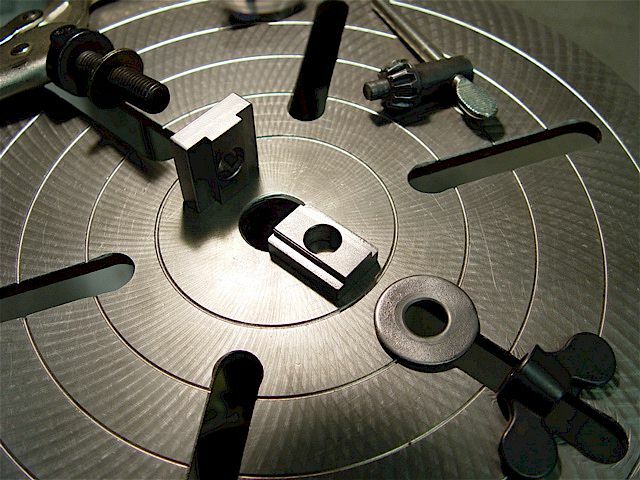 A wide variety of precision work-holding fixtures are available. 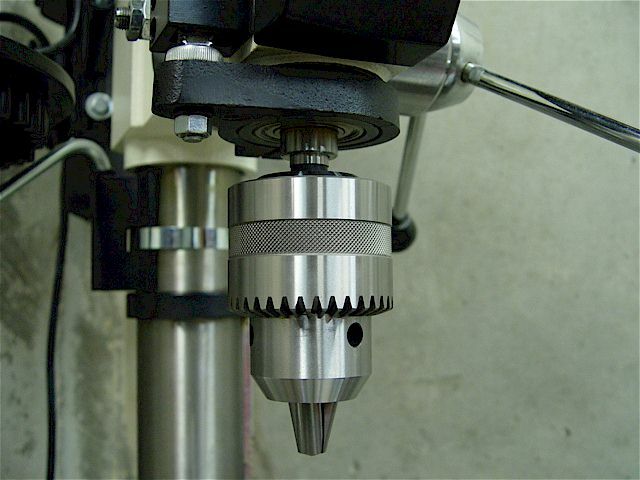 An R-8 mounted Super Chuck (1/8" ~ 5/8" or 3mm ~ 16mm), turning at a high speed, on the RF-25 Mill. 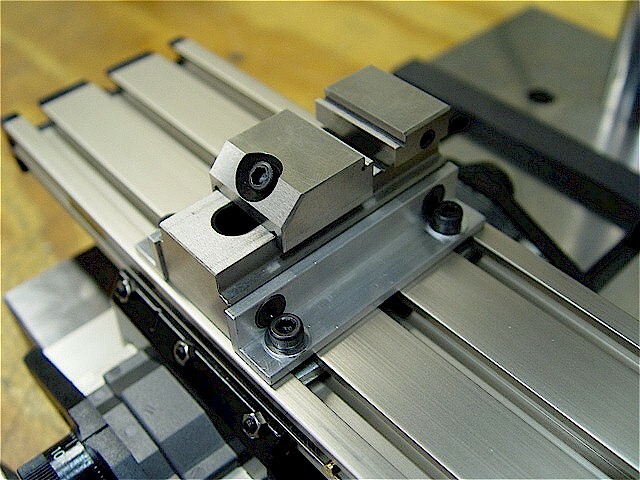 Two parts are secured in the mill's vise with small clamps. 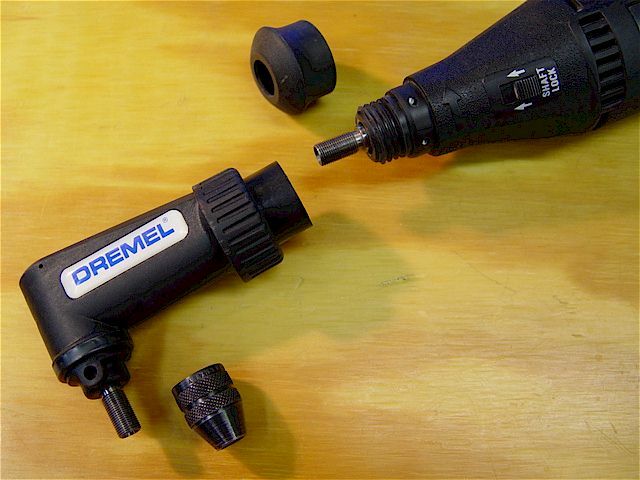 Short, stiff, stub drill bits used. 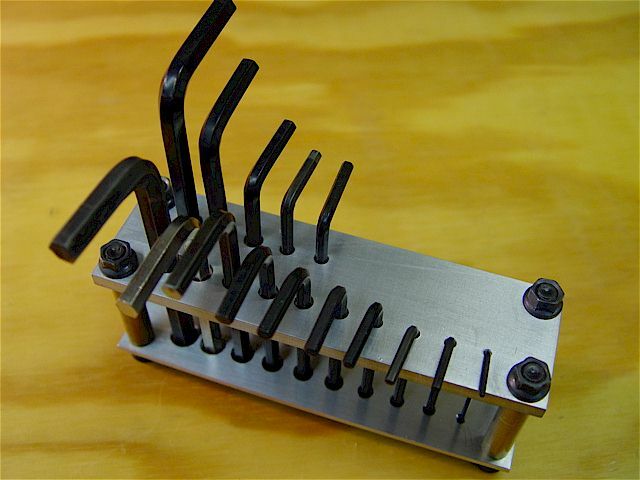 An aluminum holder for spare imperial & metric hex wrenches. 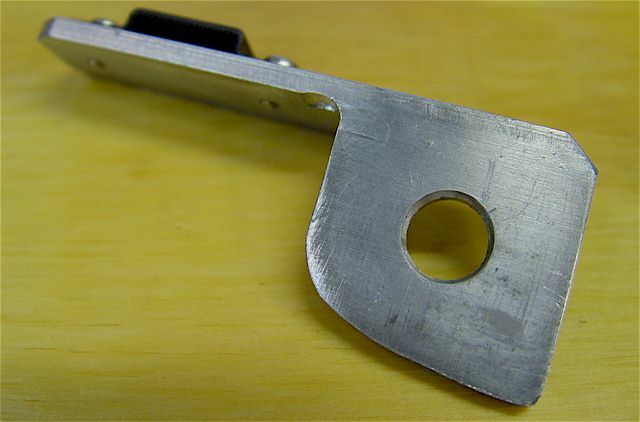 The 1/4" top plate helps guide the keys to the bottom plate. Both plate holes have heavy champers. The feet have felt pads. I could have 1/4-24 tapped the top plate. 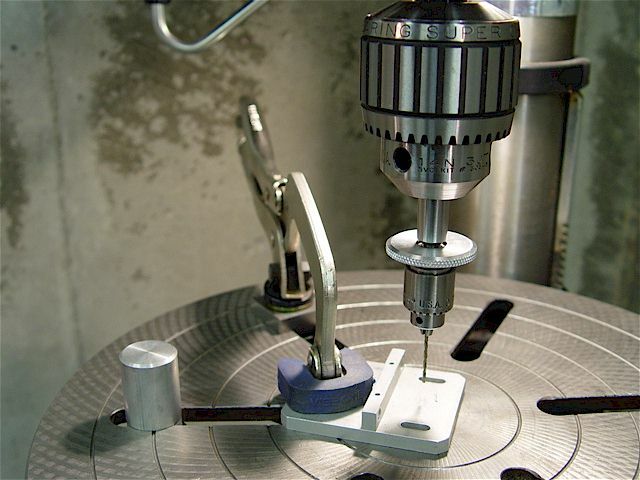 come in a large number of size combinations allowing adaptation of almost any chuck to a given spindle. 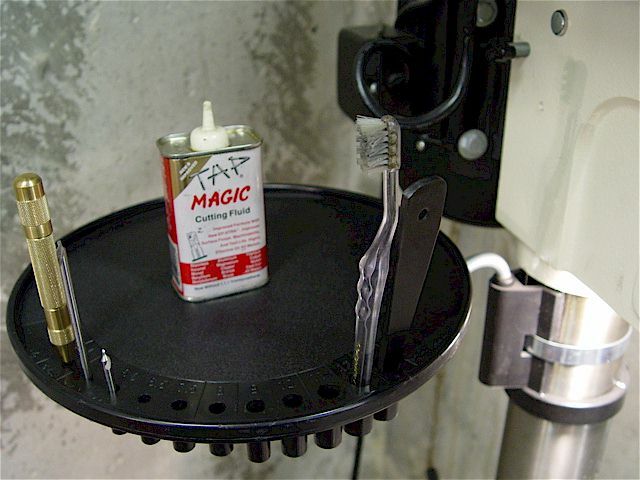 An adjustable work-stop peg fits into a table slot. 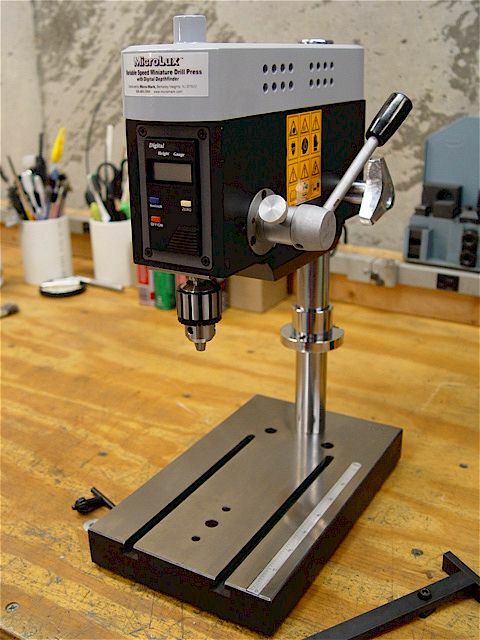 Refer to the Jet JDP-17 drill press manual. 16 speeds: 200, 290, 350, 430, 500, 580, 640, 720, 800, 870, 1440, 1630, 1820, 2380, 2540, & 3630 RPM. 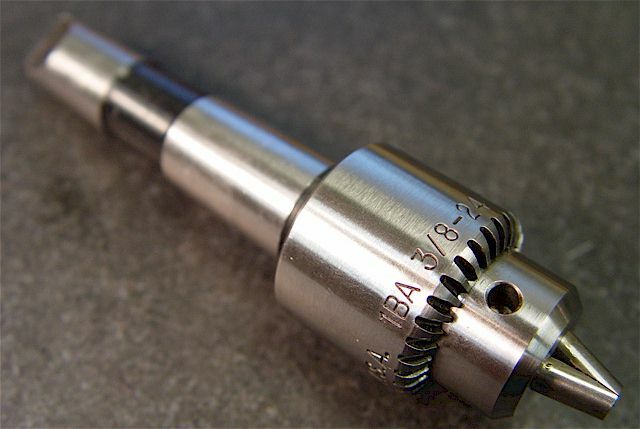 A 1/64" to 3/4" capacity keyed drill chuck with a JT3-MT2 arbor. This large chuck is 2.95" in diameter (Taiwan) & can hold large-shank reamers. 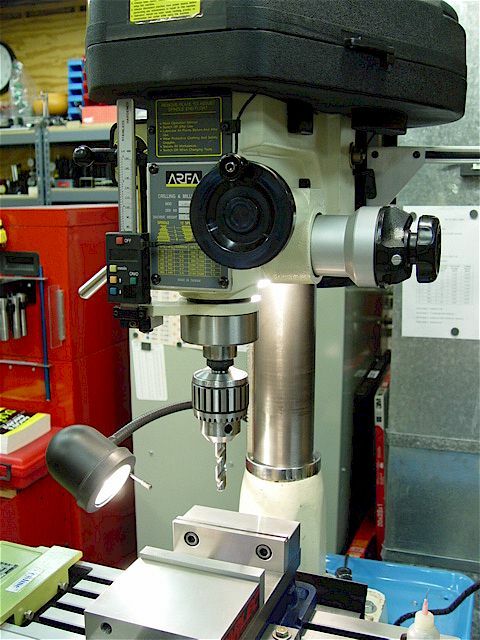 The arbor eject access slot in the floor drill press is exposed by extending the spindle & rotating the chuck. Thirteen drill chucks of various sizes & arbors in a wooden holder. I have no rusting issues using wooden stands. 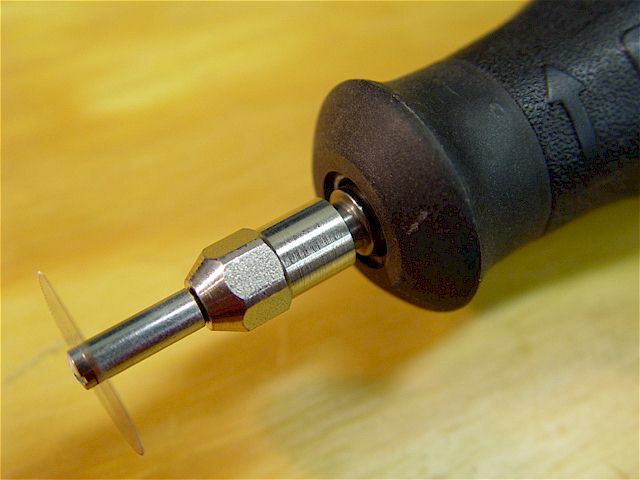 See additional information on Drill Chucks. 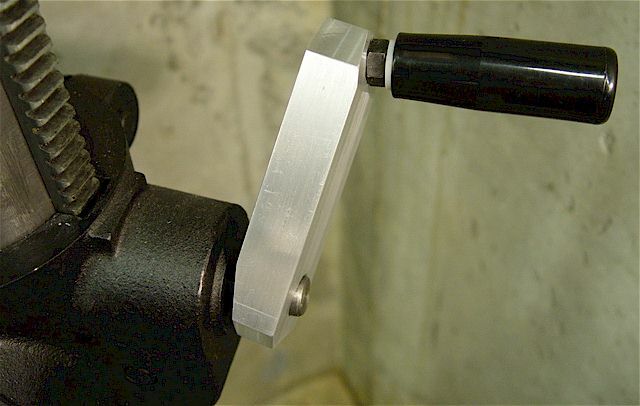 Never use a taper-mounted chuck without a drawbar if side forces are being applied. 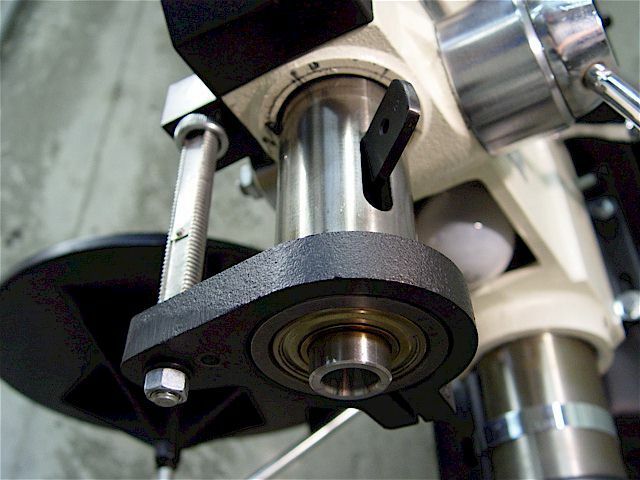 Side forces can cause a taper-mounted chuck to loosen & spin-off at dangerously high speeds causing injury. 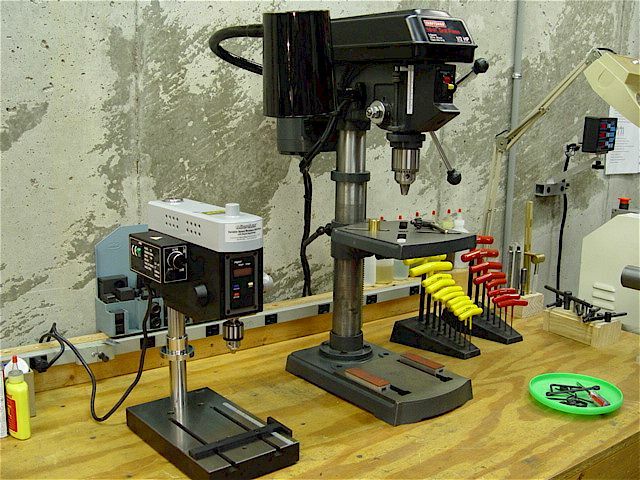 Installed a scale onto the large floor drill press spindle while retaining the Jet's depth stop gage. Two-inches of the eight-inch scale were hack-sawed off & the end diamond ground with radii corners. 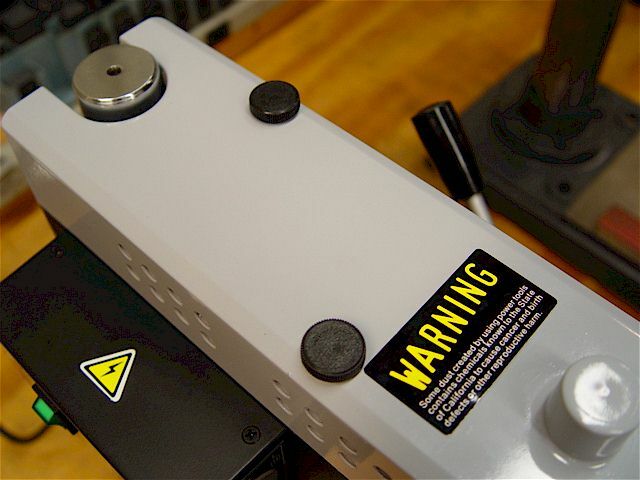 The top end free floats like the RF-25 mill Z-axis modification & will retract via the spring. Eight-inch scale supplied with adjustable surface-mounting brackets. 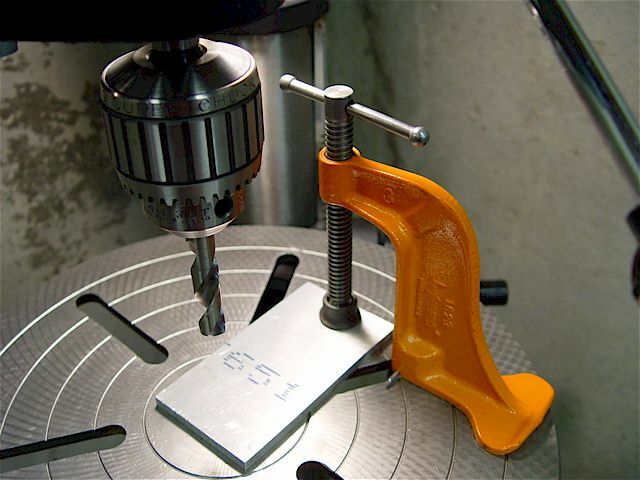 The original aluminum depth stop was not square so it needed to be milled first. Sometimes cast parts have angled sides so they can be easily popped-out of their molds. A 1/4" plate bracket was made. 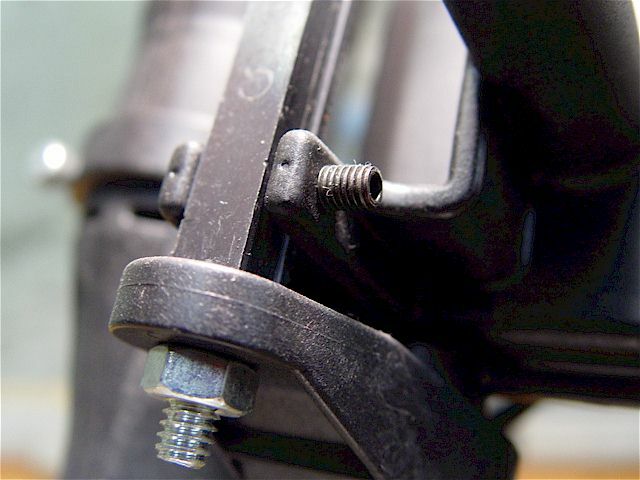 The M3-0.5 mounting screws are located in-between the OEM mounting bolts. 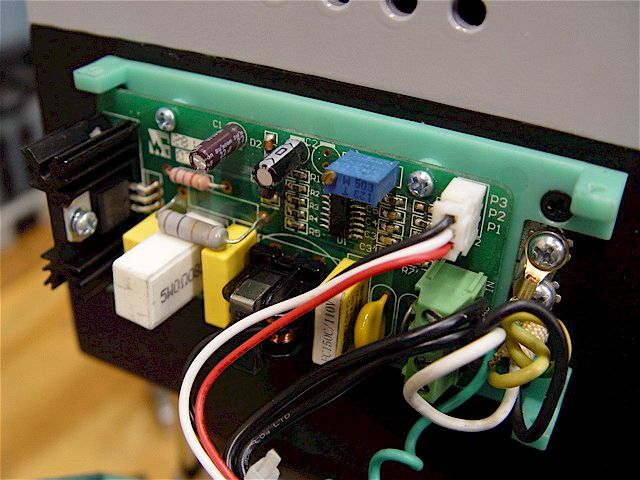 M3-0.5 screws hold the scale's transducer to the stationary bracket. 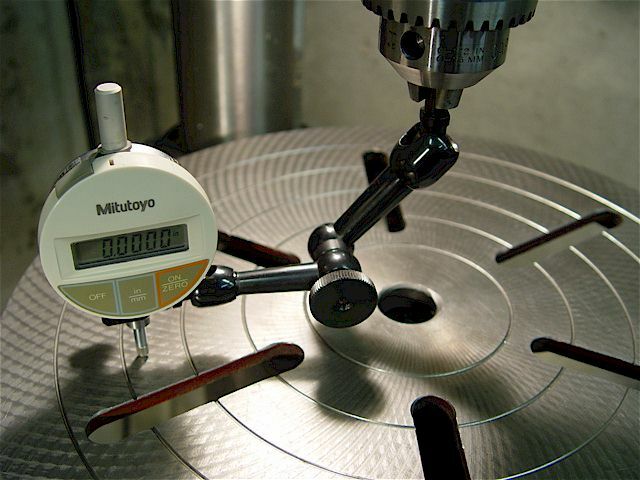 robust with increased repeatability. Note the washer in-between the two stop nuts helps adjustment & locking. The washer works well enough that I placed one in-between the adjustment nuts of the bench drill press, too. 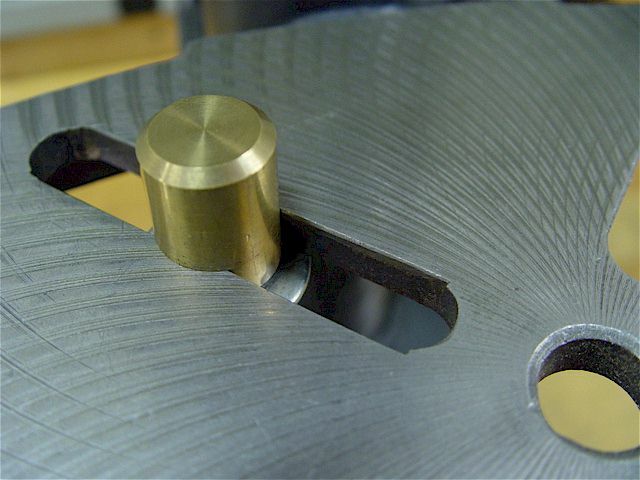 The Jet also has a third nut that can hold the spindle extended to a set depth. It too now has even contact. 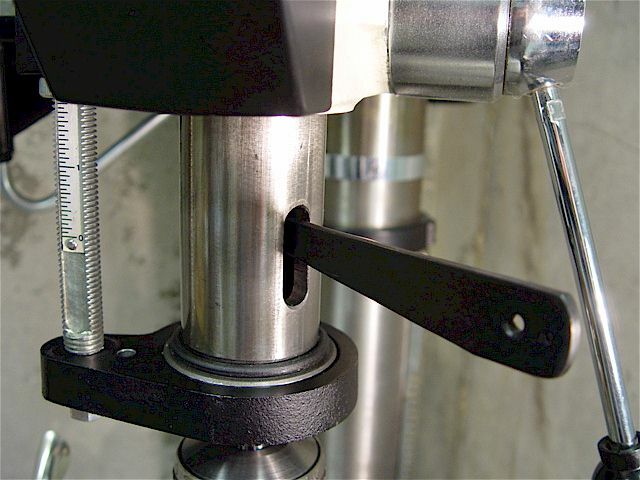 This bracket attaches through a W-sized hole to the Jet's 3/8-16 depth gage bolt & spindle bracket. 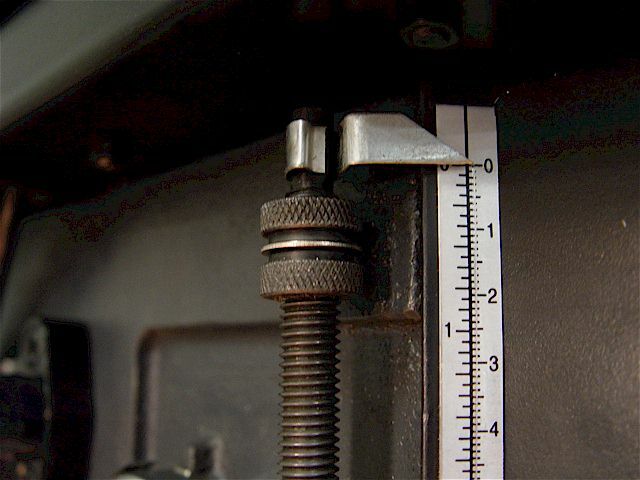 The scale's original clamp & screws were retained to capture the scale's end. 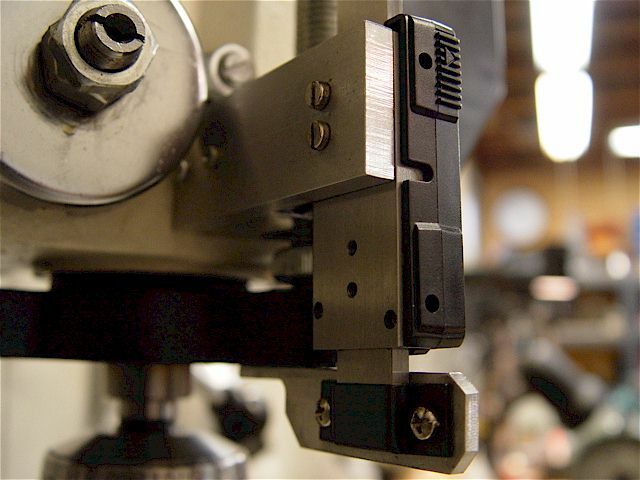 If the M3-0.5 screws are too long they will touch & interfere with the slide's movement. 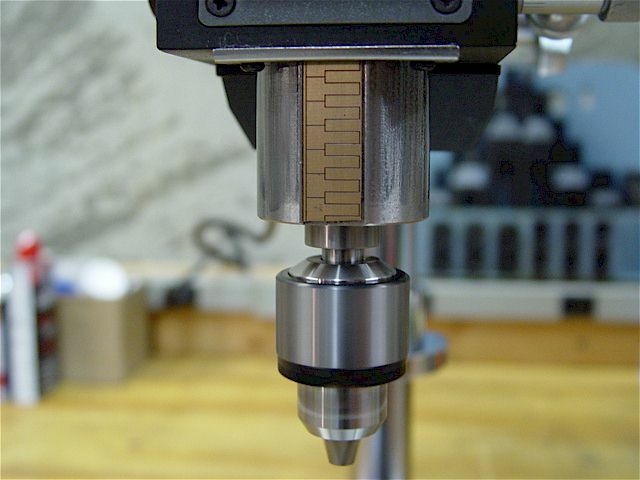 bottom edge of the transducer aligns with the zero thus functionalizing the mechanical inch & metric scales. 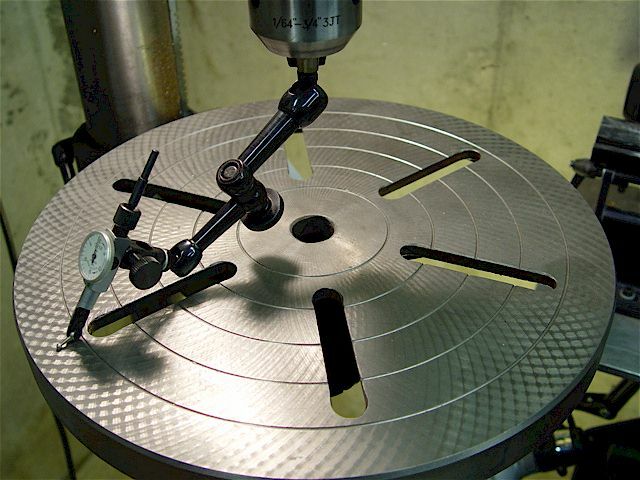 Aligning the drill press table. Adjustable aluminum table stop to keep the part from turning. 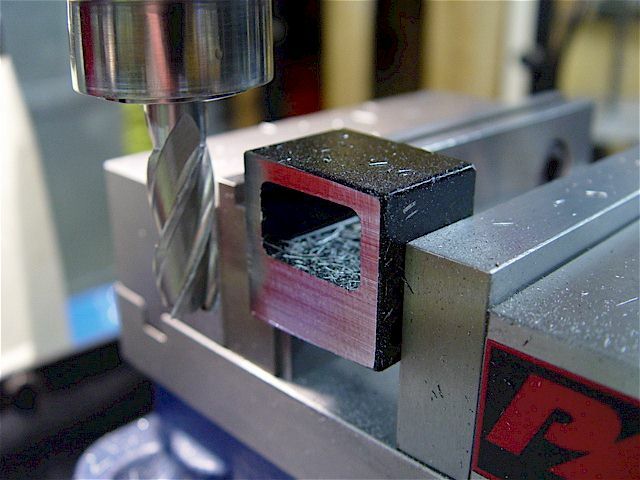 Place the part or vise against it before drilling. Exploded view showing the stop's construction. 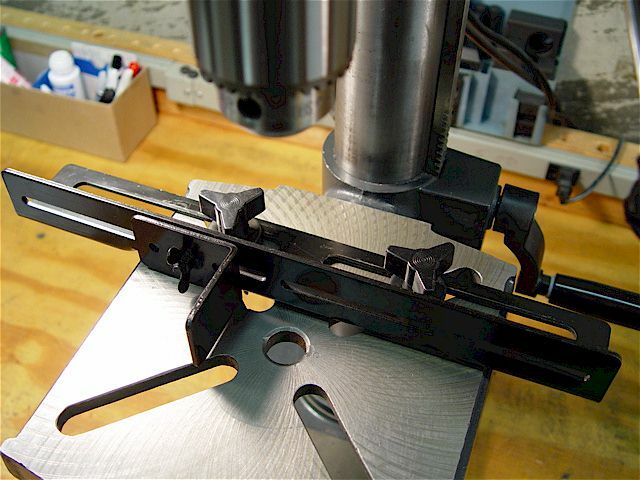 Vise-Grip adjustable table clamp. 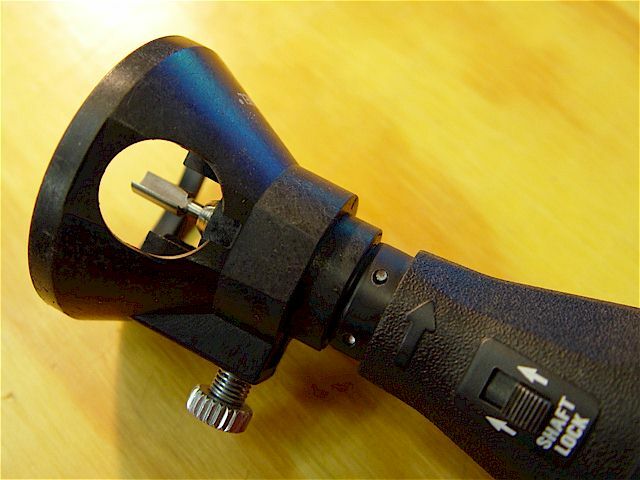 The clamp foot has a removable rubber boot. Exploded view of the steel T-adapters & hardened washers that hold the clamp base securely in the table slot. 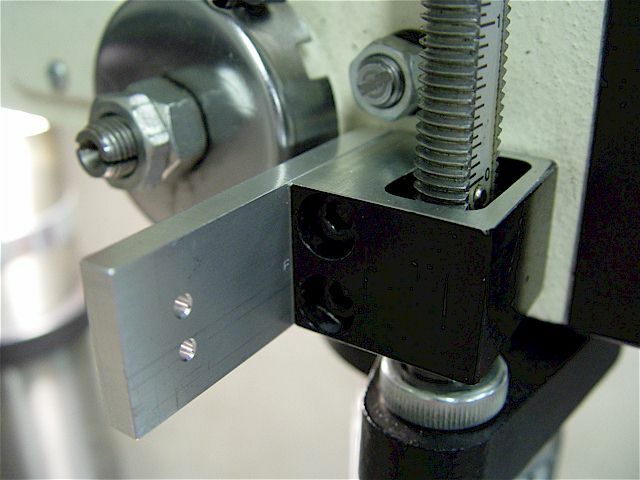 The T-adapters keeps the slots from being worn & gouged by the smaller base under heavy clamping pressures. Select 3", 4", 5", 6" jaw widths. Jorgensen No. 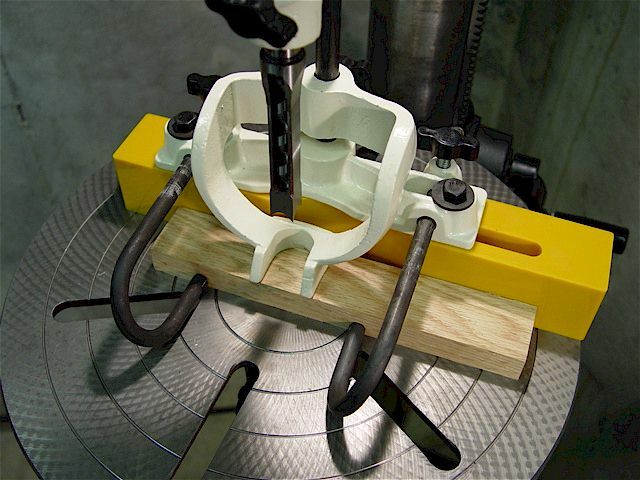 1623 drill press table hold-down surface clamp (USA). Very well made product. 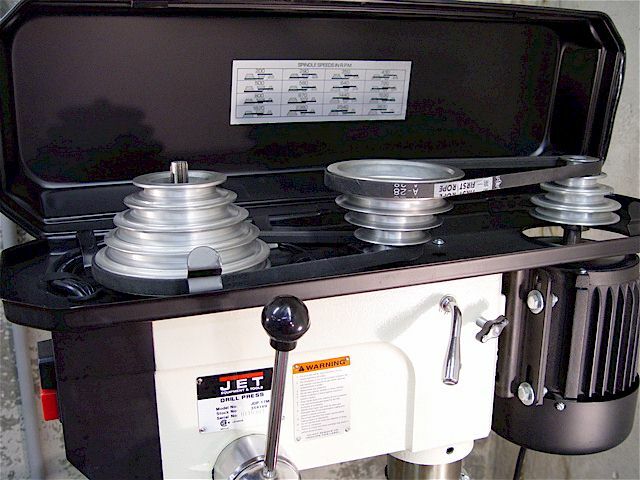 Specifications: 3" opening capacity, 1-3/4" throat depth, 9/16" Acme screw, 2000-lbs.normal load limit, cast iron. Clamp disassembled. 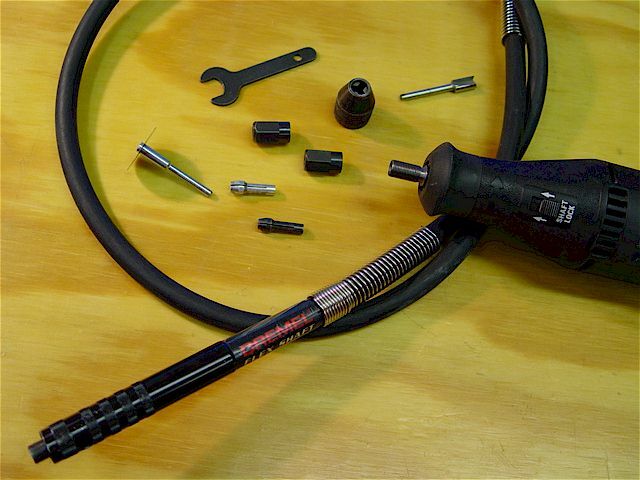 The cotter pin allows quick installation & easy use. 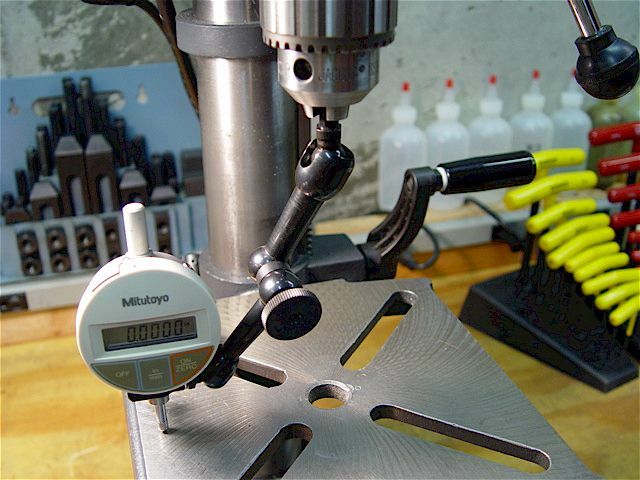 A useful accessory for the drill press that increases safety & precision. The original table height adjustment (plastic) handle cracked so a longer aluminum one was fabricated. 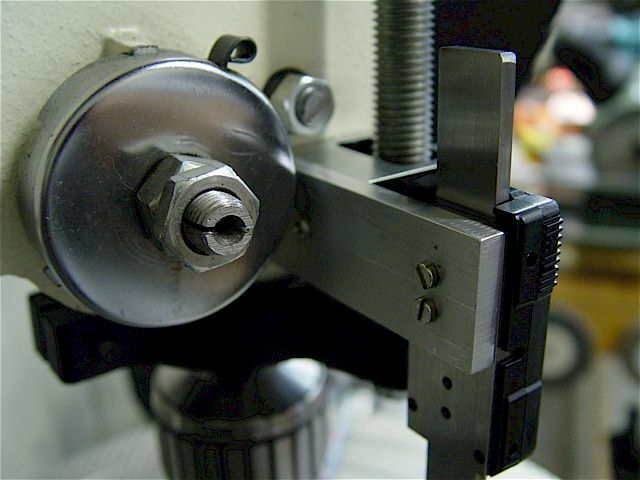 The slots for both the bench & floor drill presses require 5/8" T-Nuts using 1/2" studs. Super Chuck is of superior quality having low TIR & the ball bearing design affords very high gripping power. 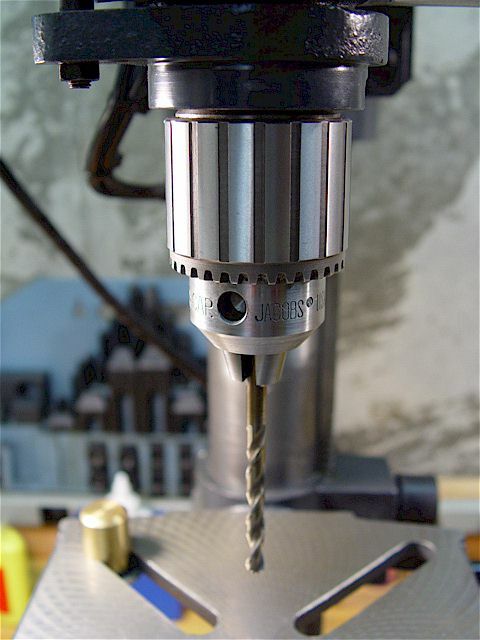 10-inch bench drill press with a upgraded Jacobs chuck. Drill press exploded diagram. 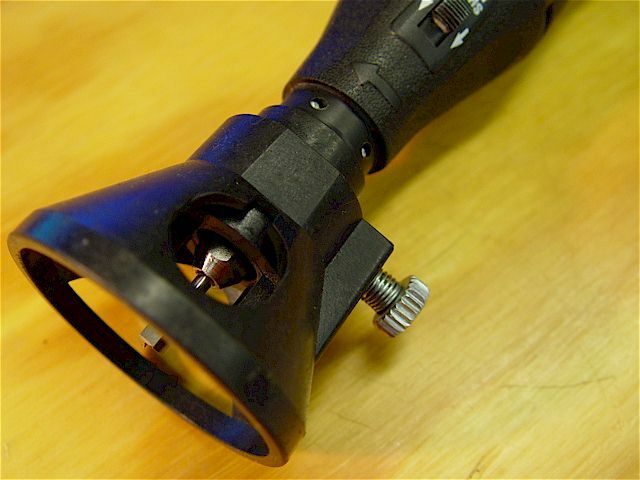 The magnetic-based work light was replaced with a fixed-base model. Five speeds: 540, 880, 1600, 2610, & 3600 RPM. 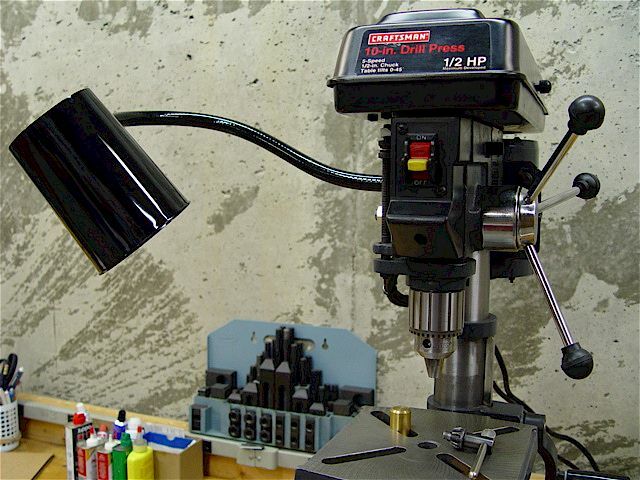 A heavy duty Jacobs taper JT33 0" ~ 1/2" (0mm ~ 13mm), keyed chuck on the bench drill press. The extra large jaws & key, coupled with high quality, totally eliminated any drill bit slippage. A washer in-between the two stop nuts help adjustment & locking. 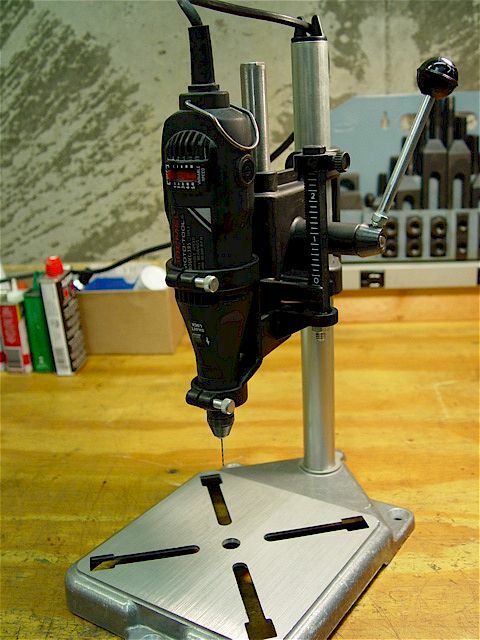 Copied from the Jet floor drill press design. Indicating the small drill press table. 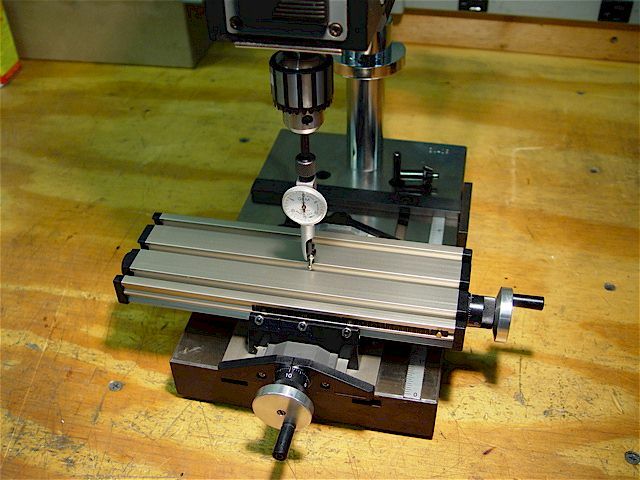 Adjustable brass table stop to keep the part or vise from turning. 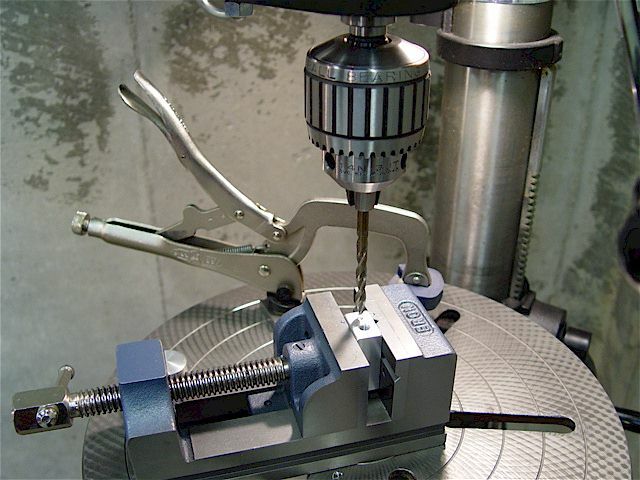 Adjustable drill-press fence; a supplied accessory. 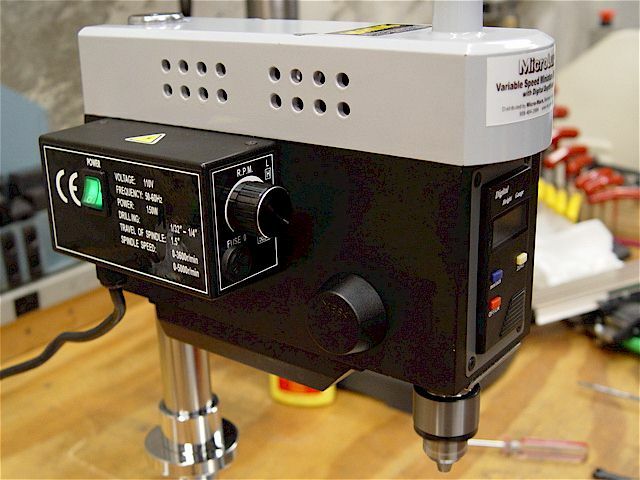 An upgraded task/machine work light (USA) for the bench drill-press setup. It uses up to a 100W (maximum) halogen or incandescent lamp. 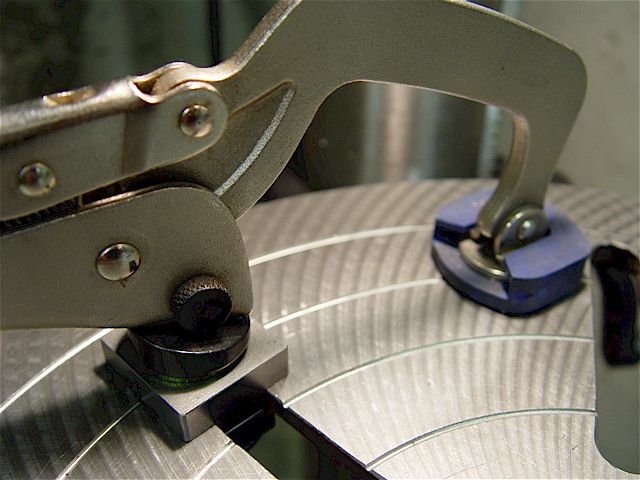 Machinists call it "autographing" when one drills or cuts the machine instead of the part. Double-walled shade with a finned aluminum heat sink keep it cool to the touch & extends switch life. The lamp's head can be directed more effectively than the previous light. 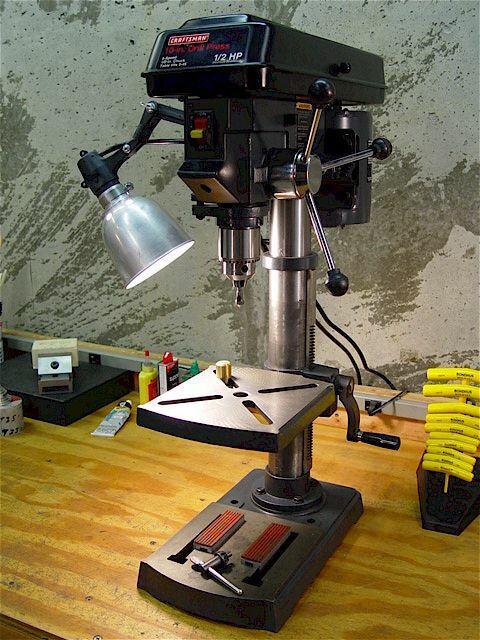 The lamp is used for both the drill press & bench top illumination. 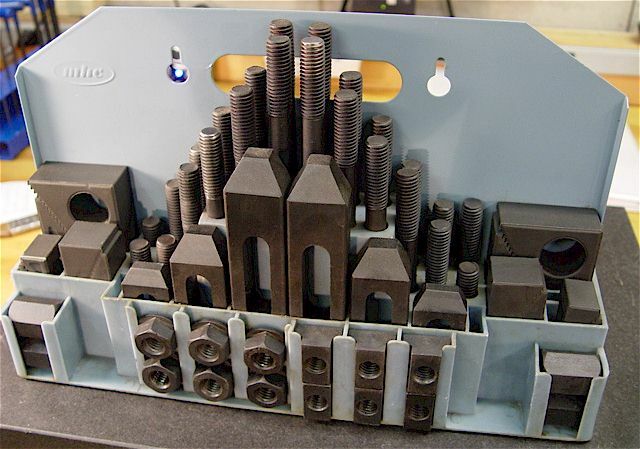 The original base bolts were 1/4-20 which were also used to bolt the base to the drill-press head. 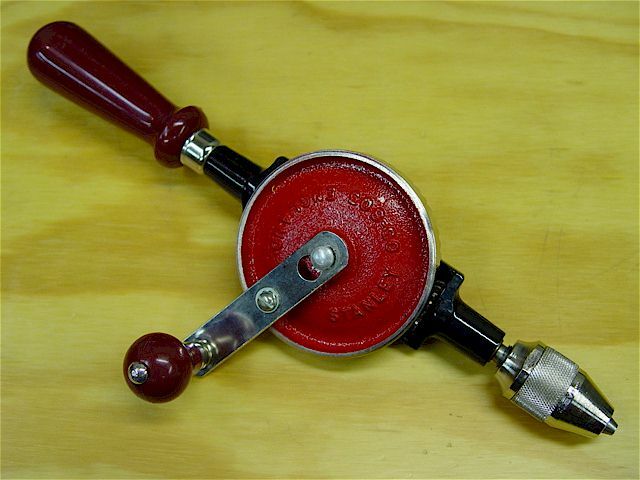 The hollow head is only 3/16" thick cast iron so strong, 75% threads were easily tapped. Now the lamp is very secure when moving the head & there is no magnet to attract metal swarf. 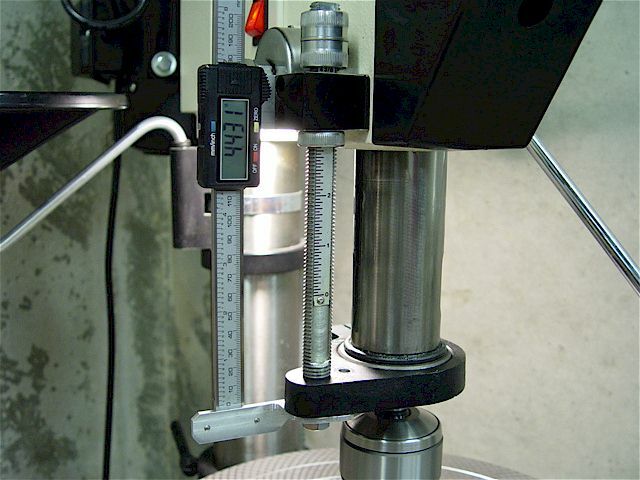 pressure than the drill press rack & pinion. 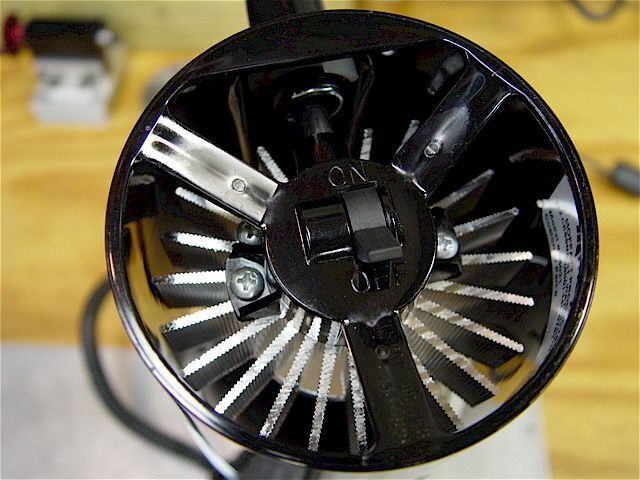 An internal coil spring automatically retracts the chuck. Jacobs keyed chuck (USA), 0 to 1/4" (0 to 6.5mm) with a JT2 - 3/8"-24 threaded arbor. Jacobs keyed chuck (USA), 0 to 5/32" (0 to 4mm) with a Royal JT0 - 1/2" micro-sensitive feed attachment. 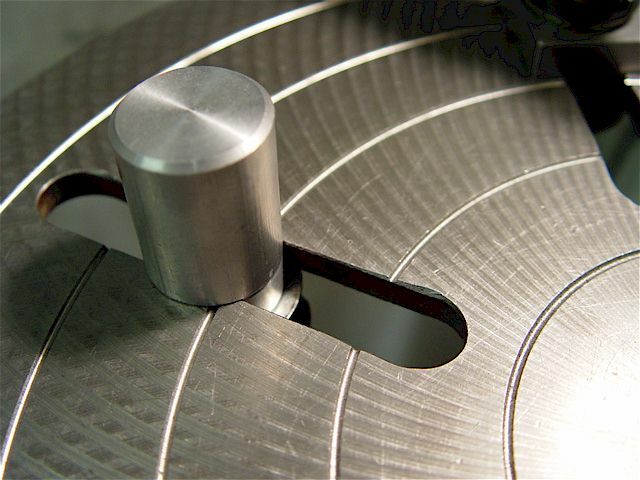 Albrecht precision keyless chuck (Germany), 0 to 1/8" (0 to 3mm) with a JT0 - 1/2" arbor. 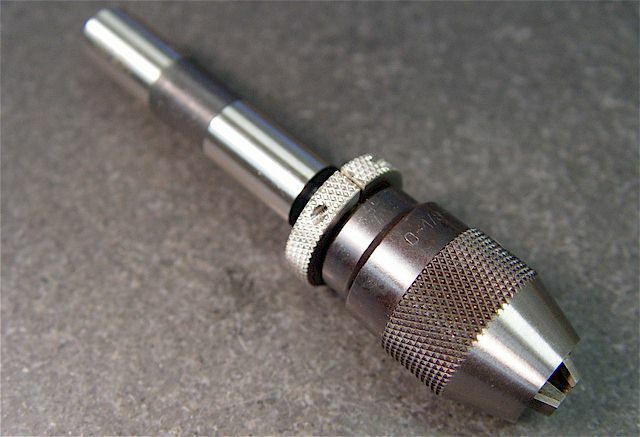 Albrecht precision keyless chuck (Germany), 0 to 0.06" (0 to 1.5mm) with a JT0 - 3/8" arbor. 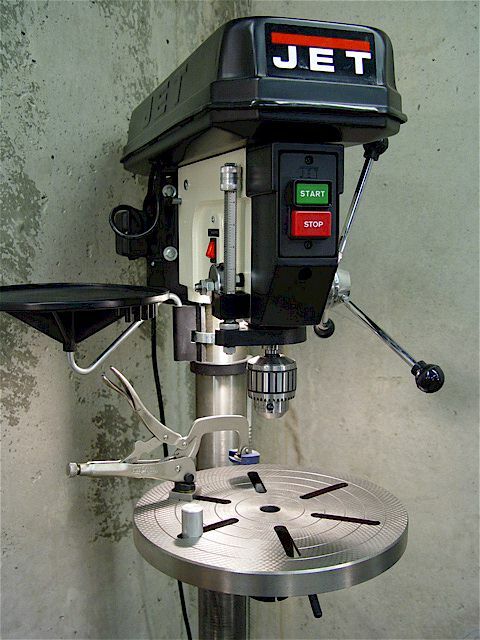 Variable-speed miniature drill press (China). The head is cast aluminum but the base is ground cast iron. The column is solid 1.181-inches (30 mm) diameter chrome-plated steel. The base has two T-slots. 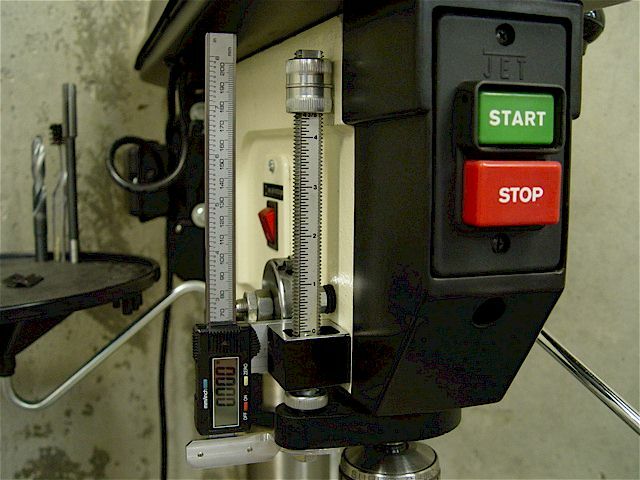 The steel spindle has an auto-ON/OFF digital depth gage with 0.0005" (0.01 mm) resolution. It retains selected units (inches or mm) but resets to zero after an auto OFF/ON cycle. 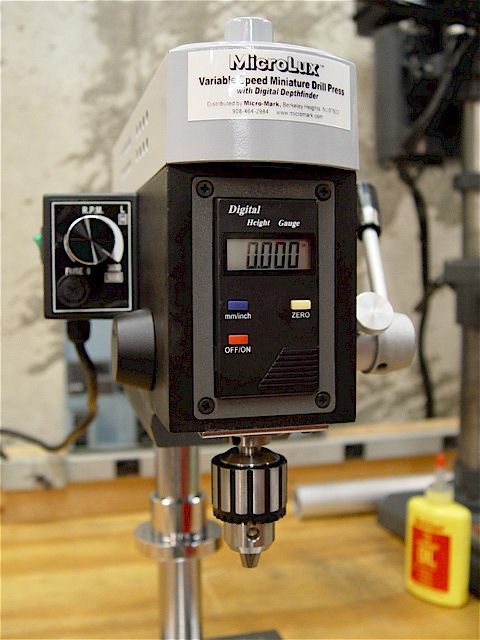 When the spindle is extended, the digital gage slide is exposed. 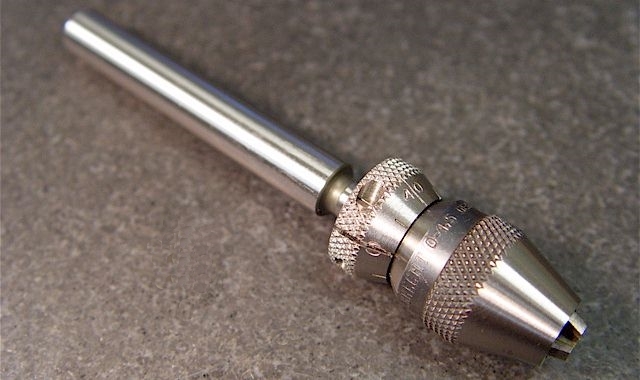 The JT1 keyed chuck has a 1/64" through 1/4" capacity. The spindle runs on multiple, sealed bearings. There is an adjustable depth stop. 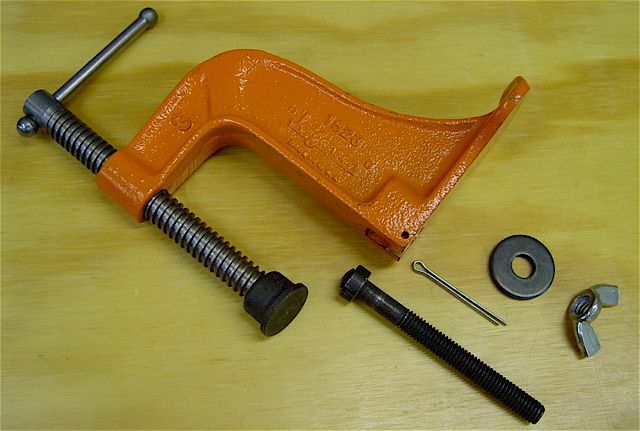 The original set screw was replaced with a metal adjustment knob. The DC motor's speed ranges are adjustable via a pulse-width modulation (PWM) circuit. 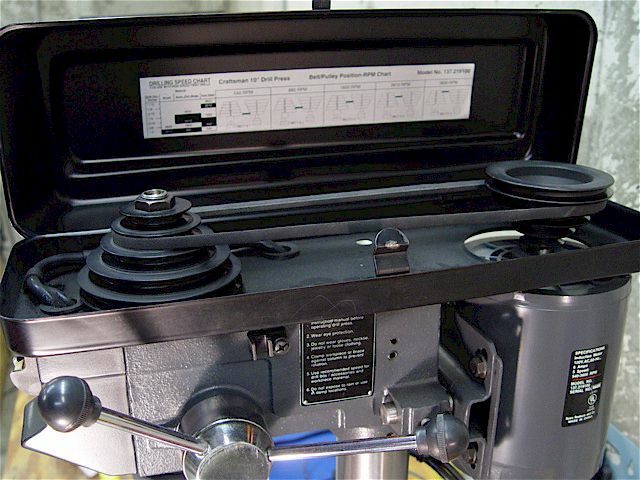 Under the cover is a two-step pulley for intermediate (3600 RPM max) & high speed (5000 RPM max) ranges. 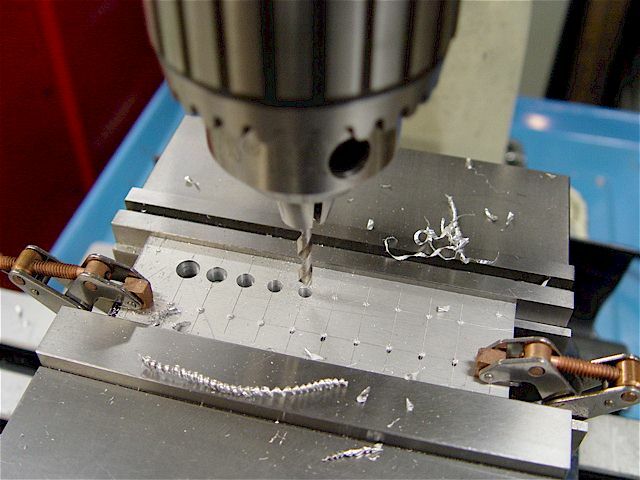 The drill press required several hours break-in period to achieve its maximum RPM (about 5300 RPM). 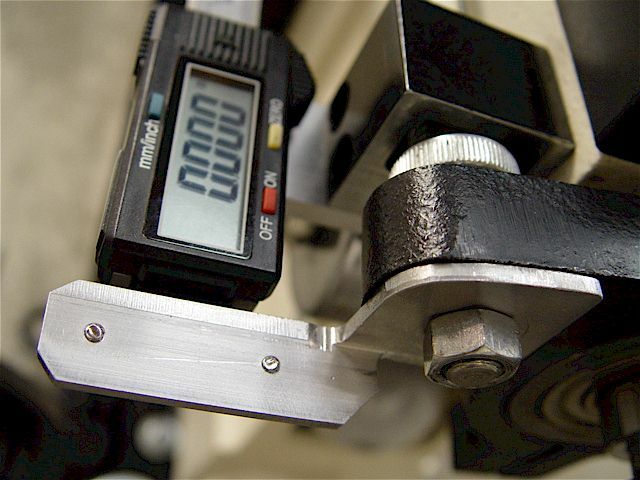 RPM varies with belt tension; the higher the tension the lower the RPM. The round belt eases pulley changes. Replaced the two, OEM cover-retaining bolts, with knobbed M5-0.8 x 50mm bolts affording tool-less removal. 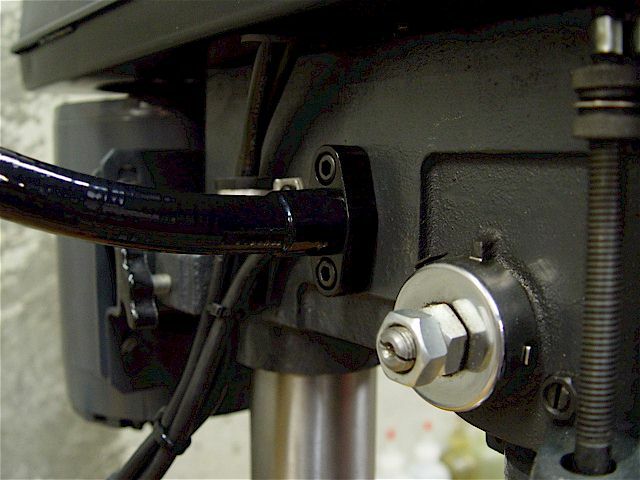 The bolt for the adjustable column locking ring was replaced with a ratchet lever for tool-less adjustments. A small, X-Y table accessory (Japan) shown mounted. 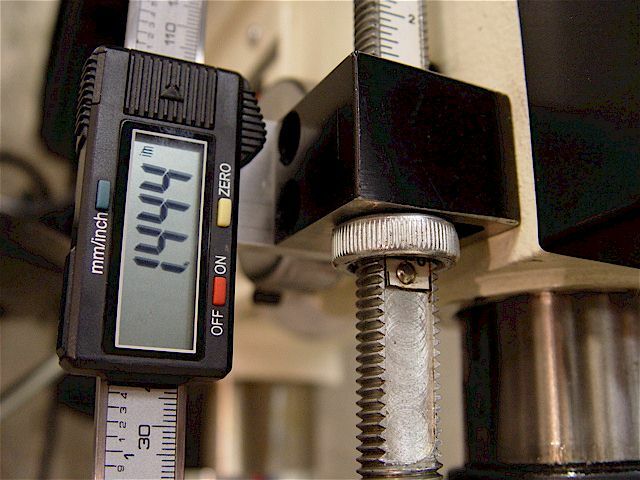 The knob scales (0.001" resolution) can be zeroed. Detail of the settable X-axis scale. The index mark is too thick (even though it's a V-groove). Attach the table to the base with the supplied M5-0.8 T-nuts then lubricate/check/adjust the both X & Y gibs. Hold a square to the two bases first for a quick initial alignment. 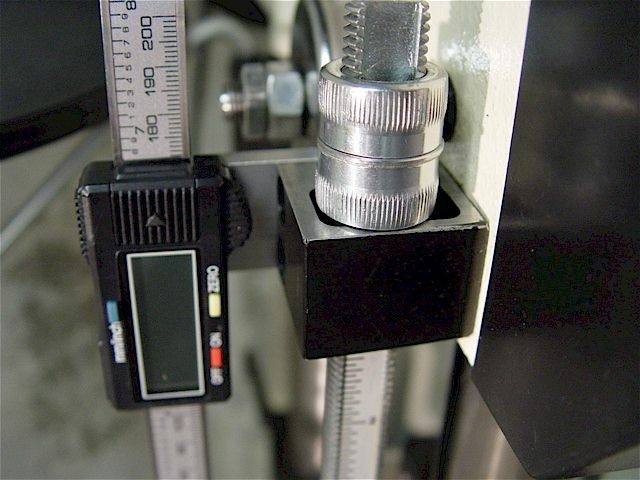 Align the X-axis using standard technique. 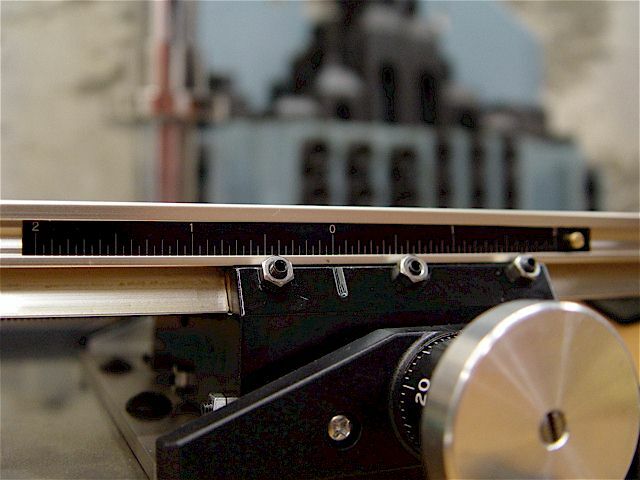 The dial test gage is indicating off the inner top back edge of the T-slot. 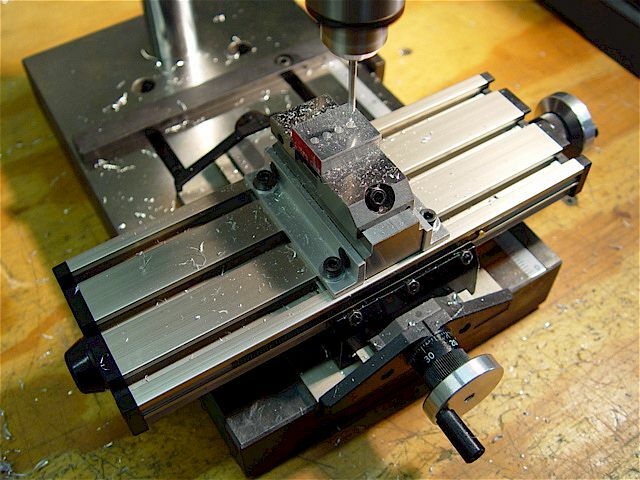 vise has six (4 side & 2 bottom) M5-0.8 tapped holes. Indicate the solid jaw using standard technique. 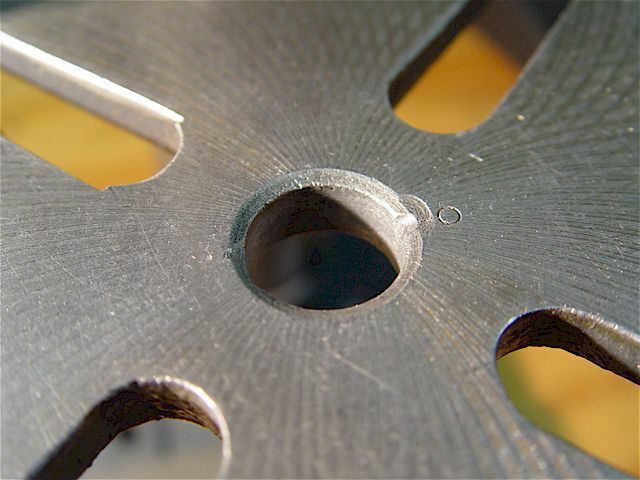 An example of four, 7/64" diameter drilled holes having 0.25" depth & 0.200" center-to-center distances. The two bench drill presses shown for size comparisons. 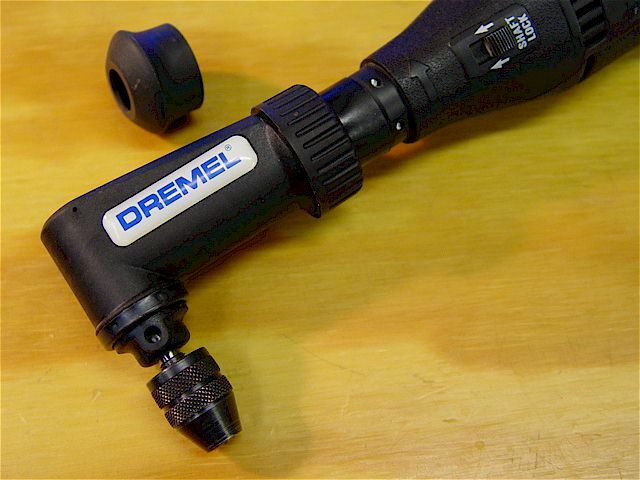 Dremel Moto-tool (395 Type 3) mounted into its aluminum & plastic drill press fixture. Not sturdy or precise. 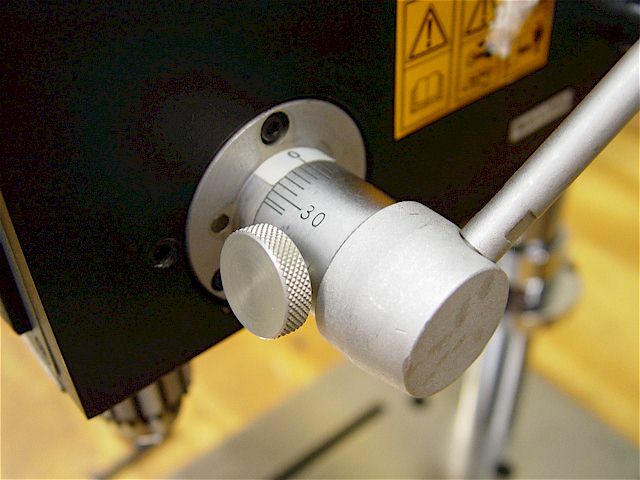 A set screw was added to the back of the plastic depth gage guide to remove most of the rotational slack. 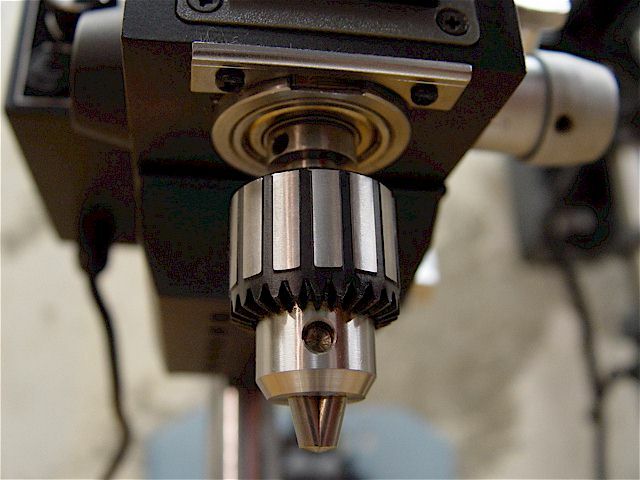 A collet with chuck being used to hold a micro-saw blade on a 1/8" shaft. 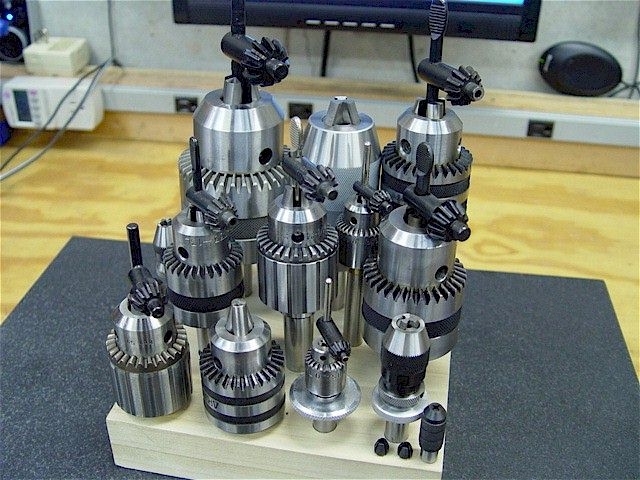 Three-jaw chuck. Note the shaft lock for tightening/loosening. A collar removes to screw-on various accessories. 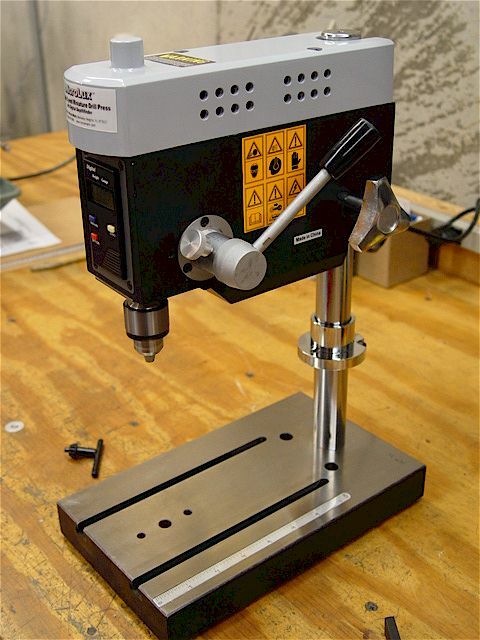 The right-angle head can be set & locked at different positions. 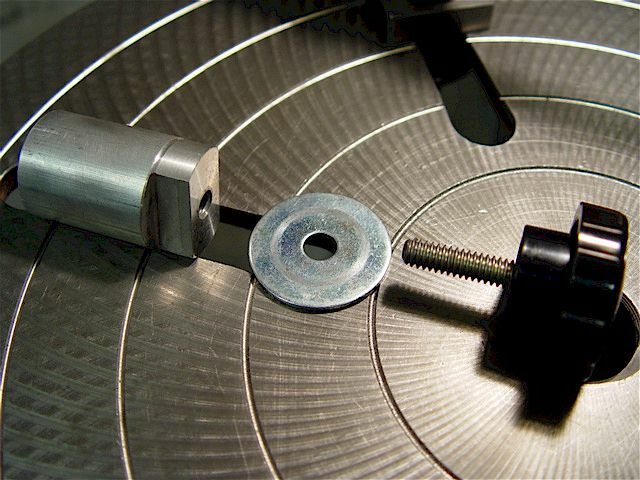 Note the hole near the chuck; a 1/8" shaft (any bit) is inserted to lock the shaft for tightening/loosening. 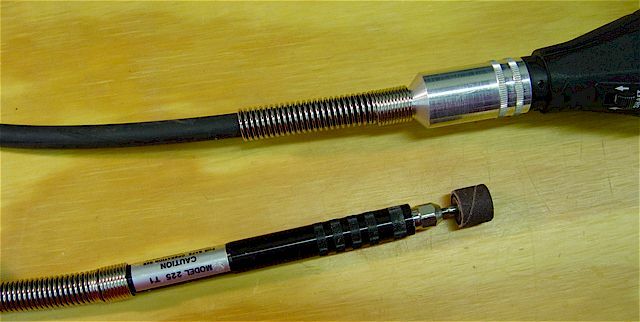 A flex-shaft accessory. 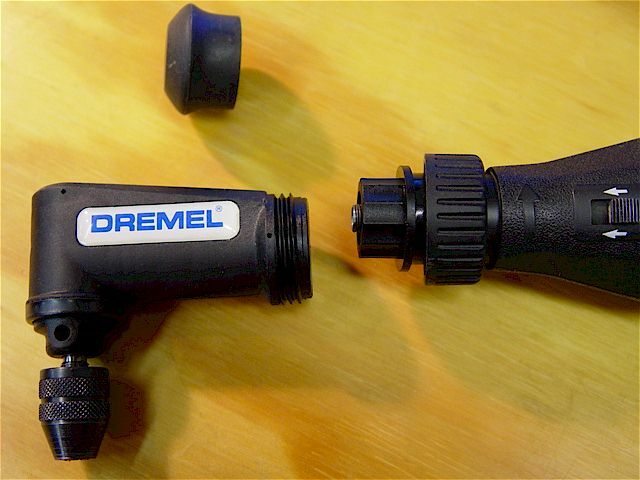 The Dremel has a rear hook to suspend it. 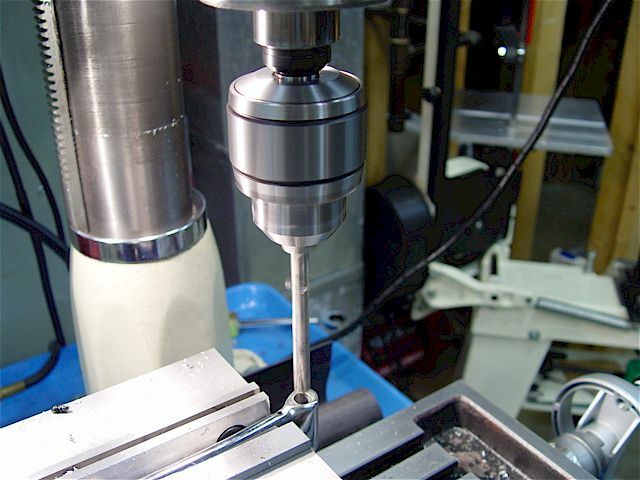 There is a hole near the collet chuck; a 1/8" shaft (any bit) is inserted to lock the shaft for tightening/loosening. 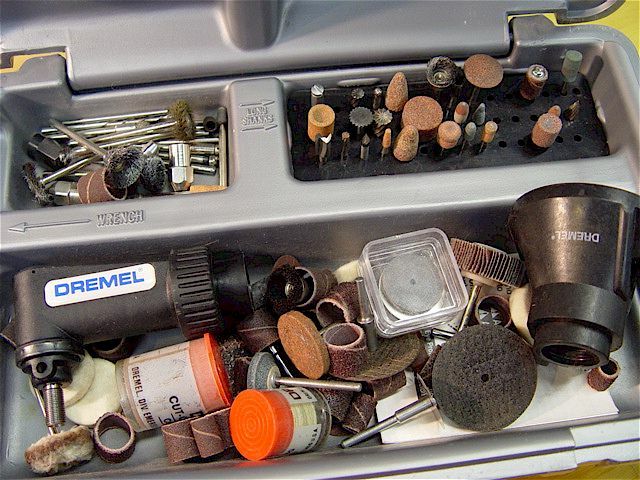 Buffers, cutters, grinders, brushes, drills, burrs, cut-off wheels, micro-saw blades, sanders. Stanley (England) No. 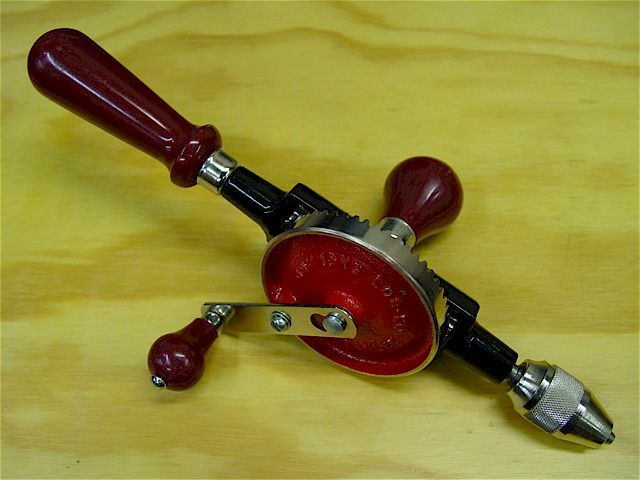 03-803 hand drill. 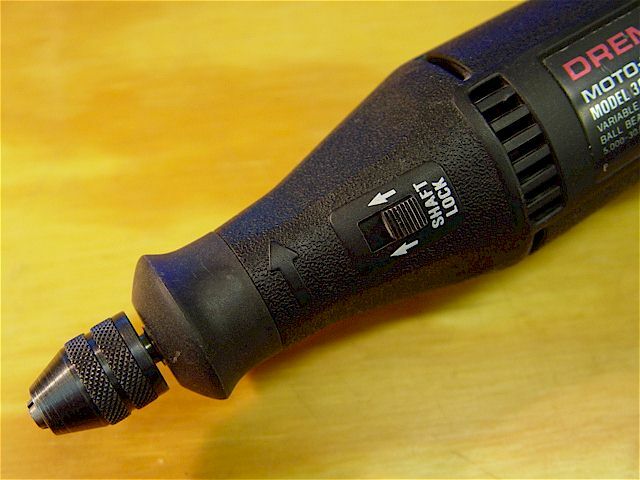 Drill shown with its accessory handle, attached. 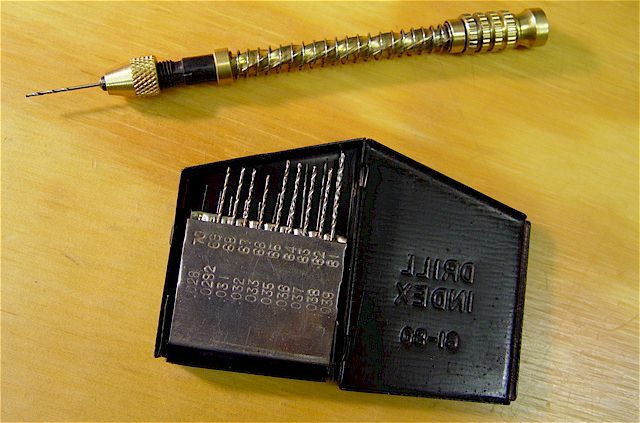 Brass jeweler's 3-1/2" long push drill (India) for 0.2-1mm micro-drill bits. Free-spinning fingertip end (right). Jet Mortising Attachment (JMA-581 manual), installed. Only shown for illustrative purposes.